Today’s post is written by guest blogger CY Cooper. She is a “foodie” who is starting to become a “chef”. Enjoy her account of a wonderful night of wine, food and fun at Central Market. CY says these events can be done with friends, family or you can go it alone. There is always good conversation plus good food and wine. Chef Juan Rodriquez of Reata Restaurant in red cap with Central Market Chef in the center and Chef Sabastien Layen of the Fort Worth Omni Hotel. The 2015 Fort Worth Food+Wine Festival is scheduled for March 26-29 and leading up to this extraordinary event will be a series of Chef’s Collaboration Dinners at Central Market/Fort Worth Cooking School. 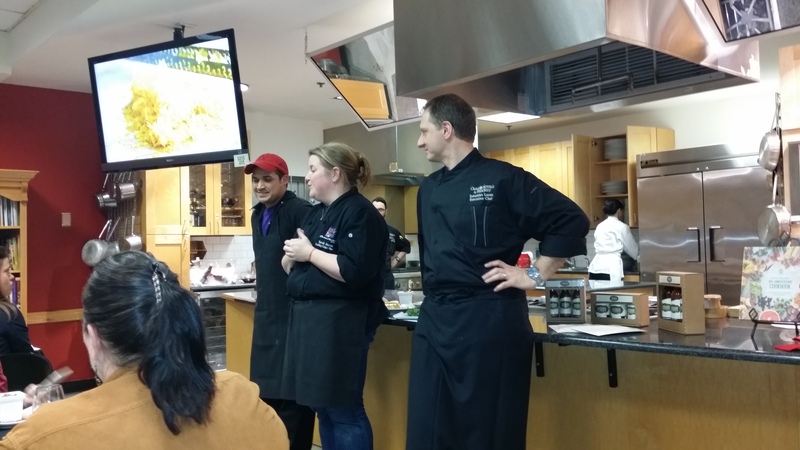 The series began last night (2/11/2015) with Chef Sebastien Layen of the Fort Worth Omni Hotel & Chef Juan Rodriquez of Reata Restaurant. The two TOP Chefs conspired together and presented 5 courses to an appreciative audience. The Second Course, presented by Chef Juan Rodriguez, was a delicious Roast Poblano Bisque w/Duck Confit and Cotija Cheese Crumbles. Texas BLT Scallop with Crumbled Chipotle Bacon, Tequila Tomato Confit and Cilantro Queso Fresco Pesto. 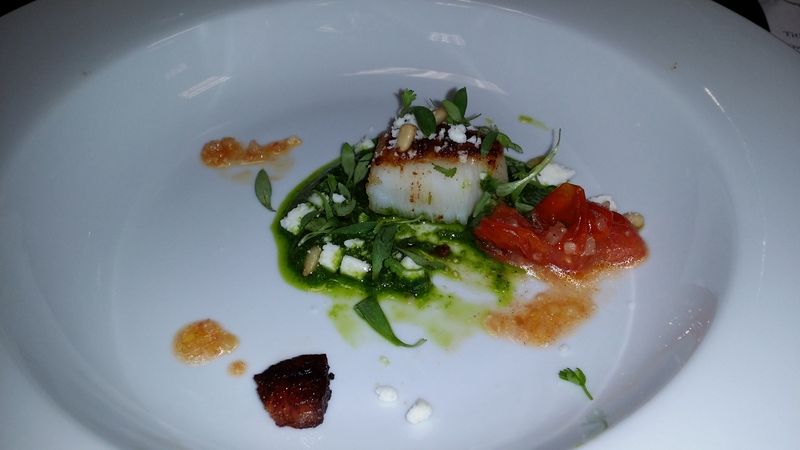 In presenting the Third Course of the Dinner, Chef Layen went the seafood route with a Texas BLT Scallop with Crumbled Chipotle Bacon, Tequila Tomato Confit and Cilantro Queso Fresco Pesto. Chef Rodriguez’s Fourth Course Presentation was Beef Tenderloin with Guajillo Choron Sauce and Jalapeno Sharp Cheddar Grits. The Third and Fourth Courses were Enjoyable and OUTSTANDING. Callebaut Chocolate Bread Pudding Tamale and Spicy Dark Chocolate Pot de Crème with Marshmallow Mousse and Chili Caramelized Hill Country Pecans. The Fifth and Final Course was DESSERT and both Chefs prepared signature desserts from their restaurants. 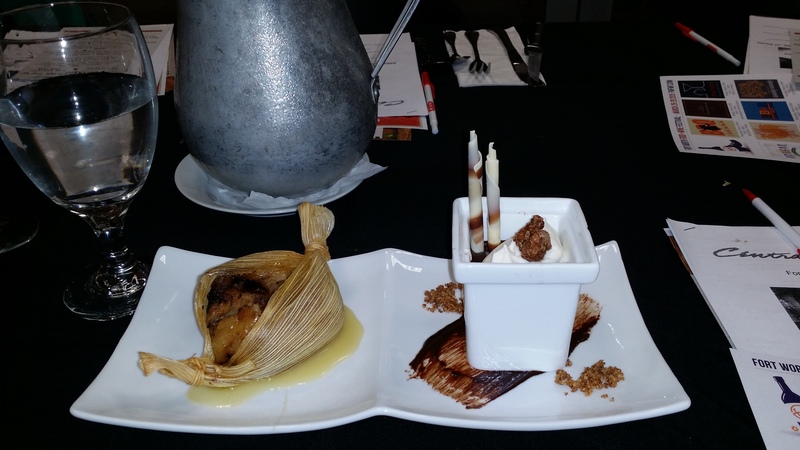 The Callebaut Chocolate Bread Pudding Tamale represented Reata (Chef Rodriguez), while the Spicy Dark Chocolate Pot de Creme with Marshmallow Mousse and Chili Caramelized Hill Country Pecans was the Omni Hotel’s standard-bearer (Chef Layen). The two Desserts were RICH, RICH, RICH and oh so incredibly GOOD. I believe I can honestly report that everyone who attended this collaboration dinner was not only impressed but enjoyed every delicious bite. The Chef’s Collaboration Dinners will continue throughout the month of February and March. Check the schedule at Central Market / Fort Worth Cooking School. Tickets for the 2015 Fort Worth Food+Wine Festival are currently on sale and can be found at their site: www.fwfwf.com. This year’s festival is being sponsored by Central Market & Ben E Keith Company. Remember “thisisyourbestyear”–do something different this year. Don’t forget to “like” us on Facebook where you can find more of “thisisyourbestyear”. The dessert sounds like it would have been the greatest pleasure on my too small plate.